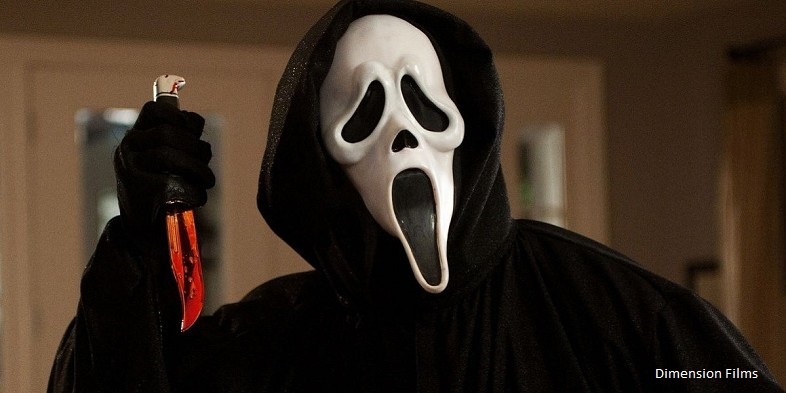 What Is the Spooky Real Life Origin of Scream's Ghostface Mask? It appears that with the creation of any sort of iconic film, there is always a little bit of serendipity mixed into the process. In an old Movie Legends Revealed, I discussed the various factors (including, improbably enough, the 1970s soft rock hit song, "Dream Weaver") that went into Wes Craven coming up with the idea for Nightmare on Elm Street. Over a decade later, Craven was once again inspired from an unlikely place for the iconic "Ghostface" mask that terrorized victims in the hit 1996 film Scream. Reader Guillermo M. asked me if it was true that the mask was discovered by Craven by accident in an abandoned house during the location scouting for the first Scream film. Did this iconic piece of horror film history really have such a spooky origin? When Wes Craven took on the project that became Scream (it was originally dubbed Scary Movie), screenwriter Kevin Williamson gave no direction for the look of the villain of the film besides "ghost mask killer." So it was up to Craven and his production team to come up with a visual look for the film's killer. In an twist of fate, one of the producers on the film, Marianne Maddalena, was doing location scouting for the film when she came across an abandoned house in Santa Rosa, California that had been used previously in the 1943 Alfred Hitchcock film, Shadow of a Doubt. Maddalena ended up not using that house but instead chose a neighboring house for the home of Tatum and Dewey Riley (Rose McGowan and David Arquette) in Scream. However, while at the first house, she discovered a striking mask hanging from a post. She brought the mask to Craven (Craven accidentally once stated that it was he who discovered the mask, but he has since concurred with Maddalena that it was she who found the mask) and he loved it. There was only one teensy little problem. The mask was the intellectual property of the Halloween mask company Fun World. It was designed by Brigitte Sleiertin as part of a "Fantastic Faces" series of masks. It came out somewhere around 1992. Originally the mask was called "The Peanut-Eyed Ghost." So now Craven was in a bind - he had a mask he absolutely loved, but in order for the film to be able to use the mask, his studio, Dimension Films, would have to license the mask from Fun World. Fun World, naturally, had quite a bit of leverage in the negotiations and they drove a hard bargain. The bargain was initially too hard for Dimension Films and they told Craven he would have to make due with a different mask. Instead, Craven had Greg Nicotero and Howard Berger of design company KNB Effects came up with their own version of the famous mask, altered enough to make it unique and not a violation of Fun World's intellectual property. This mask was actually used in the first few scenes in the film, including the famous opening sequence with Drew Barrymore. It is quite possible, though, that Dimension Films was just trying to prove to Fun World that they would be willing to do the film without the mask to get them to come down on their asking price in the negotiations. After all, Dimension Films knew that Craven still wanted to use the Fun World mask in the film. Fun World and Dimension Films finally came to a licensing agreement and Craven was able to use the original mask in the rest of the film (it was at this point that Fun World came up with the new official name for the mask - "Ghostface"). The film was a massive success (spawning three sequels) and the mask has since become one of the most popular Halloween costumes ever, making Fun World quite a bit of money. A rare win-win for everyone involved! Interestingly enough, the upcoming Scream TV series debuting this week is going without the Ghostface mask (the show's producers explained that it is because in the show the mask is tied to the origins of the killer instead of simply being, as they note, "a $1.99 costume the killer grabs in a costume shop and threw on just to be anonymous, or to scare people", although I personally cannot help but think that the fact that they will not have to pay a licensing fee for this new mask must play some sort of role in the decision, as well), so It's the end of a Scream era! Thanks to Guillermo M. for the question! Be sure to read more film legends like this at my archive of movie legends here. Feel free (heck, I implore you!) to write in with your suggestions for future installments! My e-mail address is bcronin@legendsrevealed.com.